Sterile adhesive bandages are packaged for individual use and to replenish first aid kits. Breathable backing repels water and dirt. Nonstick absorbent pad won't stick to wounds for gentle removal. 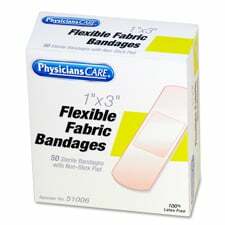 Bandages are latex-free.